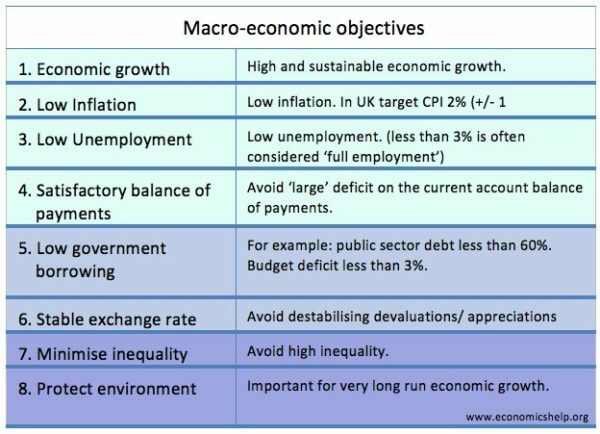 A look at the main macroeconomic objectives (economic growth, inflation and unemployment, government borrowing) and possible conflicts between these different macro-economic objectives. Low government borrowing/public sector debt. One macro-economic conflict can come between economic growth and inflation (which leads to a similar conflict between unemployment and inflation). If there is rapid economic growth, it is more likely that inflationary pressures will increase. Inflation is particularly likely to occur when growth is above the long run trend rate, and AD increases faster than AS. When the economy is growing very quickly, firms have difficulty employing sufficient skilled labour; this can lead to wage inflation and higher wages cause higher prices. Also, if demand grows faster than supply, firms will respond to shortages by putting up prices. 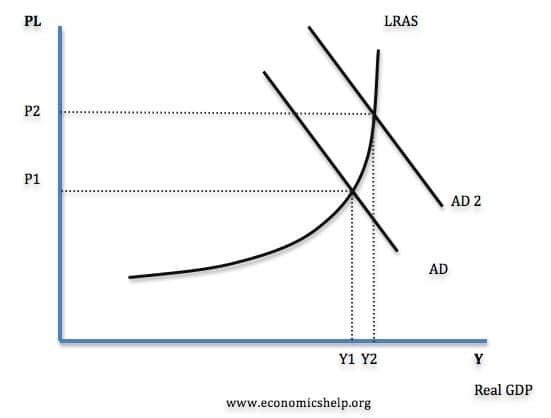 In this diagram, there is an increase in AD, when the economy is close to full capacity. We get an increase in real GDP but also an increase in the inflation rate. 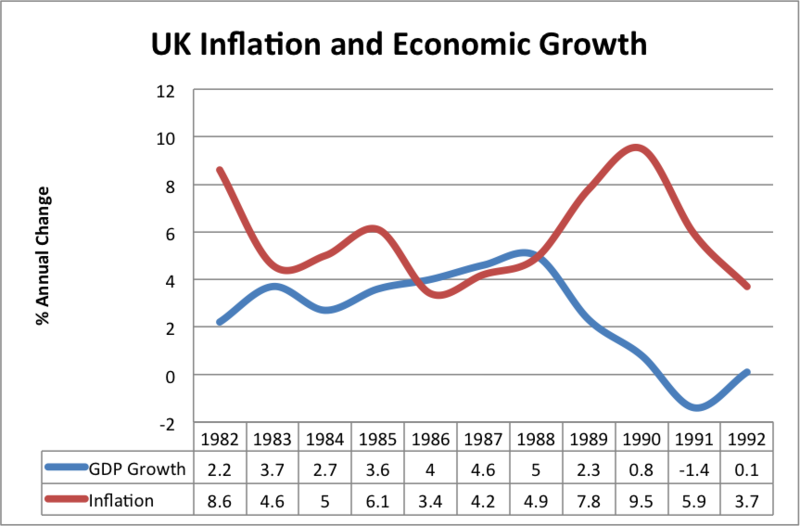 In the late 1980s during the Lawson boom, the UK experienced a high rate of economic growth (4-5% a year). This growth rate was above the long run trend rate of growth but caused inflationary pressures to increase. Also if growth is very quick, there may be supply constraints pushing up commodity price increases. This economic boom of the 1980s proved unsustainable and ultimately led to the recession in 1991 (as the government increased interest rates to try and control inflation. 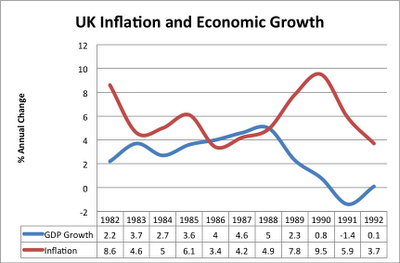 The rapid economic growth of 1986-1989 led to inflation increasing to nearly 1%. It required interest rates of 12% and the recession of 1991/92 to bring inflation under control. However, it is possible to have economic growth without causing inflation. 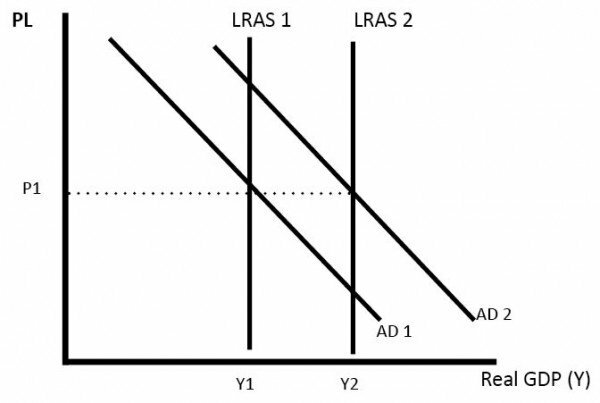 If growth is sustainable – if it is close to the long run trend rate, then LRAS will increase at the same rate as AD, and therefore, we will not see inflation. Economic growth without inflation. AD and LRAS increasing at the same rate. The UK between 1993-2007, had a long period of economic expansion. But, this prolonged economic growth did not cause inflation. This is sometimes known as the great moderation. 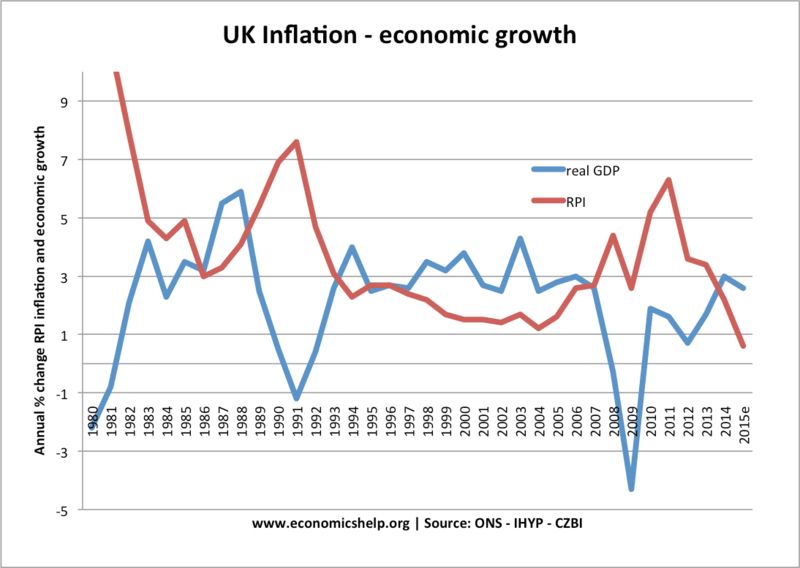 The UK great moderation from 1992 to 2008 – low inflation, positive economic growth. When economic growth is led by consumer spending, it tends to cause a deficit in the current account. This is because as consumer spending rises, there will be a rise in import spending. This is especially true in the UK, where traditionally we have a high marginal propensity to import (MPM). Also, high economic growth may increase inflation and make exports less competitive. 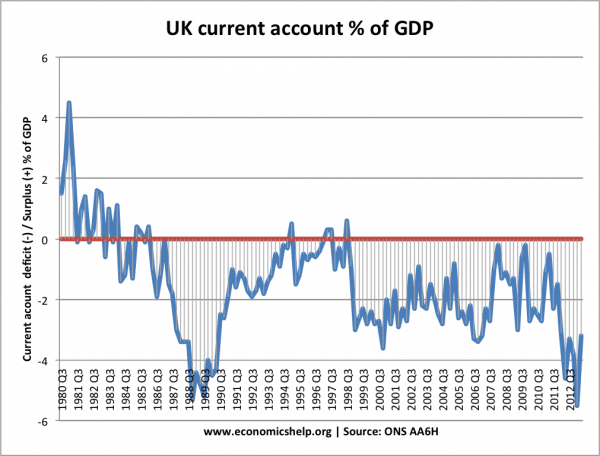 The late 1980s saw an economic boom and a growing current account deficit. The recession of 1992, saw a fall in import spending and a decline in the current account deficit. However, if economic growth is export-led, then there can be an increase in economic growth without causing a current account deficit. For example, Germany has seen strong economic growth, but it often runs a current account surplus. See more – Is there a conflict between economic growth and the balance of payments? A government may feel it needs to reduce the budget deficit. This will require higher taxes and lower spending. However, this tightening of fiscal policy will lead to a fall in AD and lead to lower economic growth. Similarly, if the government wants to boost the rate of economic growth it could pursue expansionary fiscal policy (tax cuts/spending rises). This should increase aggregate demand and help economic growth – but there will be a side effect, the budget deficit will rise. If policies to reduce a budget deficit lead to unemployment and lower growth, the government will need to pay more on benefits and will get lower tax receipts. Therefore the deficit may experience only a small reduction. This has been a dilemma for European governments since the austerity measures of post-2010. However, it depends on how you reduce a budget deficit. For example, if you raised the retirement age and made it more difficult to get welfare benefits, then you can reduce government spending, but there is little negative impact on economic growth (in fact, people have to work longer, increasing LRAS). Though there may be side effects on issues of equality and fairness. There can be a strong conflict between economic growth and environmental objectives. Higher GDP leads to higher levels of pollution and consumption of non-renewable resources. However, it is possible to have economic growth without harming the environment. For example, the development of solar panels has helped increase energy productivity, but it is also better for the environment than burning coal. There is often a trade off (at least in the short run) between unemployment and inflation. In a period of high growth – jobs are created, causing unemployment to fall. But, as unemployment falls, it can put upward pressure on wages, leading to inflation. The Phillips curve suggests there is a trade off between these two objectives. For example, a cut in interest rates leads to higher Aggregate Demand (AD). Higher AD leads to higher growth (Lower unemployment) but also higher inflation. 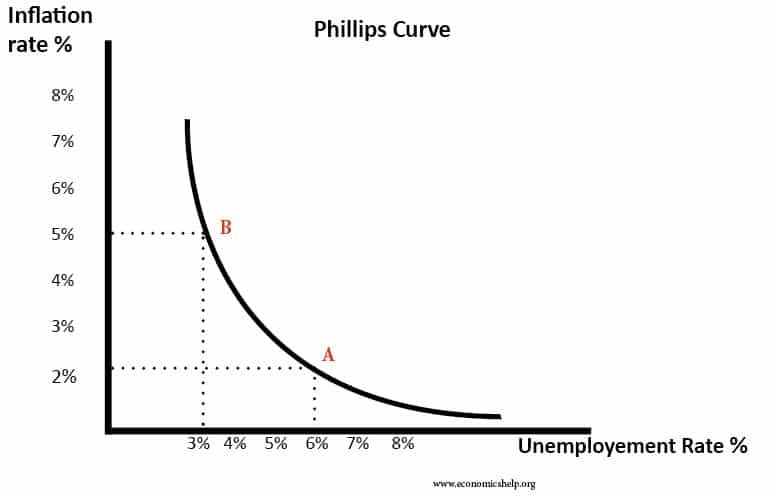 Therefore the Phillips curve trade-off moves from A to B. But, it is possible to reduce both inflation and unemployment. If successful supply-side policies are used, you can reduce structural unemployment without causing wage inflation. Also, if the growth is sustainable, inflation will remain low. See also: Is there a trade-off between inflation and unemployment? Should primary macro-economic objective be low inflation?